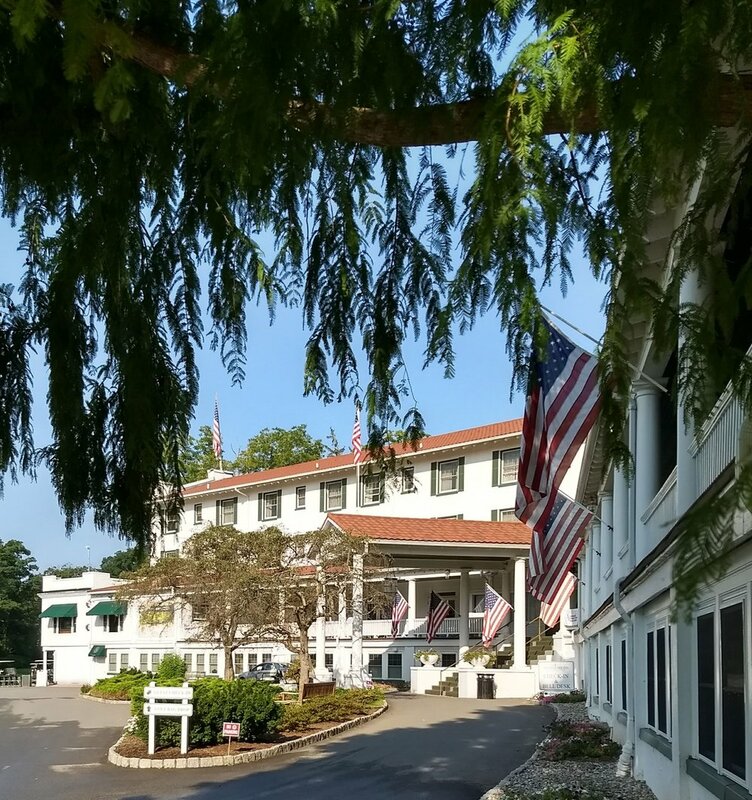 This year's conference was held at the Shawnee Inn Thursday, August 23 to Saturday, August 25, 2018 at the beautiful Shawnee Inn on the banks of the Delaware River in the Pocono Mountains of northern Pennsylvania. The front entrance of the Inn. Most used the side entrance across from the parking lot. I drove up on Monday and stayed 3 nights with a volunteer I knew in Kenya and her husband. Thursday AM I left and headed north from Coatesville, PA to Nazareth, since 1833 the home of the C.F. Martin guitar factory. I took a guided tour that was fascinating. The company employs 500 people on shifts. Robots and lasers do the rough work of cutting out shapes then the rest is done by hand as it's been done for decades. Just to be clear, this was not part of PC Connect! I registered when I arrived about 1:45 and picked up my conference program. I had scheduled a meeting with Ella Dowell (Jordan 2011-15), Community Technology Systems Coordinator for the National Peace Corps Association, for 2:00 PM. The purpose of the meeting was to get an update on SilkStart and to discuss pricing for NCPCA should we choose to change our status from free with limited benefits to "Affiliate Pro" with considerable benefits. It was a productive meeting. At 3 I drove back to East Stroudsburg to my AirBnB lodging. It was more in line with a retiree's budget than rooms at The Inn. 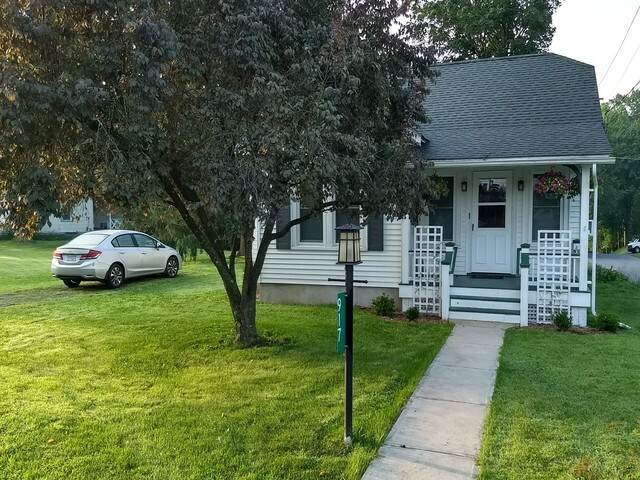 This bungalow was beautifully renovated and was in a quiet neighborhood in East Stroudsburg. At 5:30 I drove back to the conference site where where there was a reception. We enjoyed generous hors d'oeuvres and an open beer and wine bar sponsored by Water Charity. NCPCA gave $1,000 to one of their projects in The Gambia organized by a Chapel Hill Peace Corps volunteer . I re-connected with a pair of RPCVs from the First Coast RPCV group in Florida, David and Bernadette Miron. They've both been super active in the group and David transitioned their old Google website to the SilkStart platform! The entertainment for the evening was supposed to be Peter Yarrow (of Peter, Paul and Mary fame) but he called in sick. The substitute entertainment was a decent 3-piece bluegrass band. But it had been a long day for me just getting to the conference so I headed back to my lodging and called it a night. 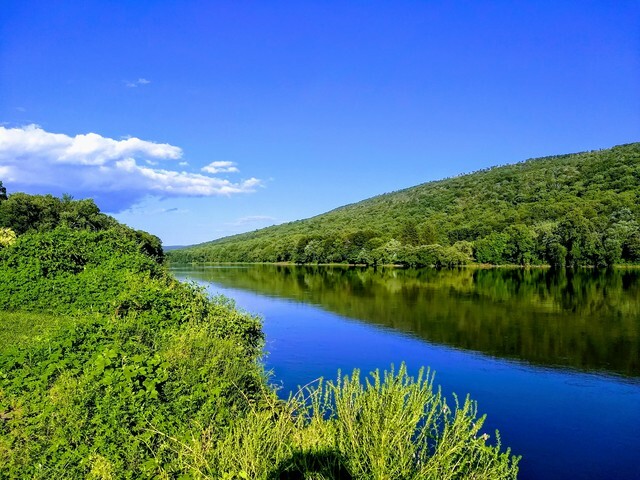 The reception was held in a large pavilion on the banks of the Delaware River, beautifully reflecting the blue sky over the Pocono Mountains. The conference started with a plenary session from 9 to 11:30 a.m. The annual General Membership Meeting was first up. The main order of business was to approve the minutes from last year's meeting. Done. We heard a Treasurer's Report that was optimistic in terms of this fiscal year revenues and expenses. There's still a carryover deficit that's being slowly whittled down. NPCA president Glenn Blumhorst gave a brief update on the activities of NPCA and told the group besides continuing to reduce an operating deficit they are working on finding new office space in Washington, DC. Charlie Dent, (R-PA) was introduced and addressed his experience in the U.S. House from 2005-2018. The RPCV who invited him lauded him as a great friend of Peace Corps through the years. Unfortunately he's retiring. Charlie told the gathering the best way to lobby members of Congress is to see them (or their staff) in person. He also related how he had enjoyed visiting PCVs in the field on trips he made abroad. 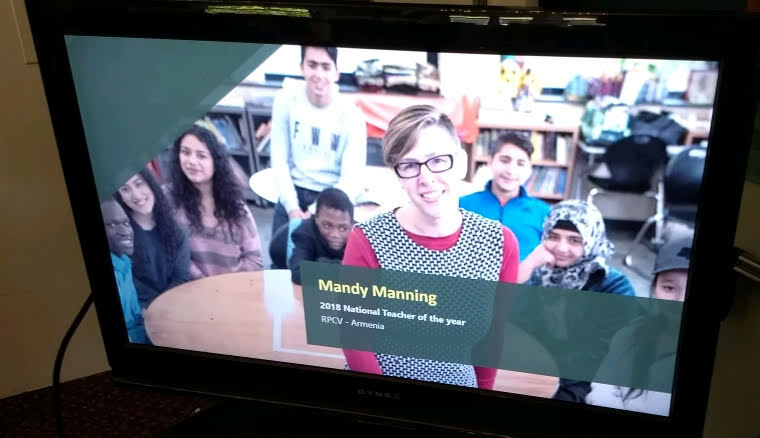 Mandy Manning, an RPCV and the 2018 National Teacher of the Year, gave a brief and inspiring talk relating how her time in PC showed her she was meant to be a teacher. She stayed around for the entire conference and was an active participant in a number of breakout sessions. Under Women of Peace Corps Legacy, Roma Guy and Diana Jones received the Deborah Harding Women of Achievement Award from Deborah Harding and made brief remarks. Their story was featured in a series on Amazon that's available for purchase chronicling the U.S. gay civil rights movement, "When We Rise". Up next was the presentation of the Harris Wofford Global Citizen award to Kul Chandra Gautam. He grew up in a country served by the Peace Corps and was influenced greatly by his contacts with a PCV. Among his many accomplishments he served as Assistant Secretary General to the United Nations. The plenary ended at 11:30 and we had until 1:00 to meet the vendors at an Exhibitor Showcase. RPCVs for Environmental Action; currently operating as a Google group; email kateschachter@yahoo.com if you'd like to be added to the group. RESULTS (the power to end poverty) - Ken Patterson, Director of Global Grassroots Advocacy, was working a table at PC Connect. He works out of Asheville and can easily conduct training for us on advocacy here in the Triangle if we have members who are interested at limited or no cost. Peace Corps Community for Refugees - We already have a few volunteers from our group who are part of this affiliate group: Eileen Hancox, Ruth Sappie, Peggy Schaeffer, and Amy Blackwell. We had a plated keynote lunch at 1:00 pm. The ballroom chairs were so uncomfortable that I don't remember who the speaker was. From 2 to 5 we had "Community Content Workshops". I attended a positive psychology workshop on "The Power of Story" as a source of well-being and one on "Media Training for Global Advocacy". There was another reception and dinner for Kul Chandra Gautam by the river. I skipped both. There's only so much sitting, meeting, and socializing one can tolerate in a day! This was a participatory workshop where we broke into teams. First we brainstormed on sheets of poster paper and listed what we thought would be appropriate story-telling techniques for different age groups. Each team was then given a country, artifacts from the country, a target audience age group, a PCV scenario, and background materials on the country. The assignment--develop a 3-minute "story" using the persona of the PCV and deliver the story to the group. I was elected to role-play the part of the RPCV from Moldova. What I had for breakfast at the Arlington Diner near my AirBnB lodging (see below) made me want to return there for lunch. There was no lunch scheduled so I skipped a plenary session where the Peace Corps Director presented the Ruppe award to the Cincinnati RPCV group. I didn't know she would be in and out so quickly and would not attend the afternoon session. A great neighborhood restaurant. Breakfast was so good I went back for lunch and dinner! 1-5 pm - Affiliate Group Network Annual Meeting The Affiliate Group Network meeting was moderated by the outgoing Affiliate Group leader from the Board. There was no college credit for the meeting so I wasn't taking notes and her name escapes me. She did a fine job moving the meeting along through 4 painful hours of sitting in the main ballroom torture seats. First order of business was to hear staff reports. Anne Baker, NPCA Vice President, made general remarks, then Ella Dowell gave a presentation on SilkStart to the group. Following those presentations we broke up into working groups where we had short presentations from the folks who'd been doing the Community Content Workshops. Topics included PC Response, Oral History Project, Advocacy, and brainstorming ideas for what NPCA can do for the affiliate groups and, taking NPCA's perspective, what things does the organization have a right to expect from the affiliates. The old "walk a mile in their shoes" concept. Many interesting ideas emerged and we exchanged lots of good information. As the conference wound down there was a rumor of a ukulele jam. That didn't materialize so I adjourned to the adjacent Shawnee Craft Brewery to fortify myself for returning to my lodging to pack up my stuff for the 10-hour drive back to Cary on Sunday! A Mosaic IPA from the adjacent Shawnee Craft Brewery. Very good! Thanks to the Steering Committee of the North Carolina Peace Corps Association for making it possible for me to go to Peace Corps Connect 2018! It was a beautiful day to tour Old San Juan--the occasional cloud offset the bright blue sky. We headed out on foot to explore with only two definite destinations: Castillo Moro and Castillo San Felipe de Cristobal. No one on the "Isle of Enchantment" seems worried about the Puerto Rican debt crisis. We're having a great time enjoying touristic activities and business goes on as usual in the U.S. territory. We visited my friend Fiddlin' Jack in Guatemala City after meeting at the airport and picking up the rental car. Played a few uke tunes and Jack accompanied on fiddle (of course) and on mandolin. Our jam went on for an hour and a half then we headed to a restaurant, Tre Fratelli, at a posh shopping mall near Jack's house. The food was good and we ate early enough to beat the Valentine's Day dinner rush. I was tired from a long day of travel so we hit the sack early. My friends Bill and Merrie had a separate suite and bathroom. My room had a giant picture window looking out on the jungle surrounding Jack's place but it was dark and I was headed for the sack. In the morning we got up early and headed out for the Lake. Bill had traveled the CA1, the road to El Salvador. A short way from downtown we stopped at an upscale shopping mall to eat breakfast and to hit the supermercado to buy a few things that aren't readily available in the village of Santa Catarina where Bill's house is. Food and coffee was great at the San Martin restaurant. The grocery store, Pais, is a WalMart subsidiary and was well-stocked with goodies you'd expect to buy at the market in the States. Here's a shot of the restaurant. Just so you know we're in Guatemala here's a shot of the parking lot with volcano in the background. Bill, Merrie, and our groceries are in the foreground. The continuation of our 1.5 hour trip was eventful. Passing a construction zone on the 4-lane Interamerican Highway I felt the thump thump thump of a flat tire on the rental car. I pulled over just past the construction, well onto the shoulder. We emptied the trunk and Bill dug out the spare. Fortunately the spare was inflated and full size. Bill jumped in and started loosening the lug nuts while I placed the jack and started to crank it up. I won't belabor the details--we changed the flat, re-packed the trunk and were on our way again. We pressed on and made two more stops before reaching Santa Catarina. One, a roadside shop with a large inventory of clay pots. Bill drove a hard bargain and picked up three nice flower pots. The other stop was at an overlook (mirador) that's the first really good look at the Lake. 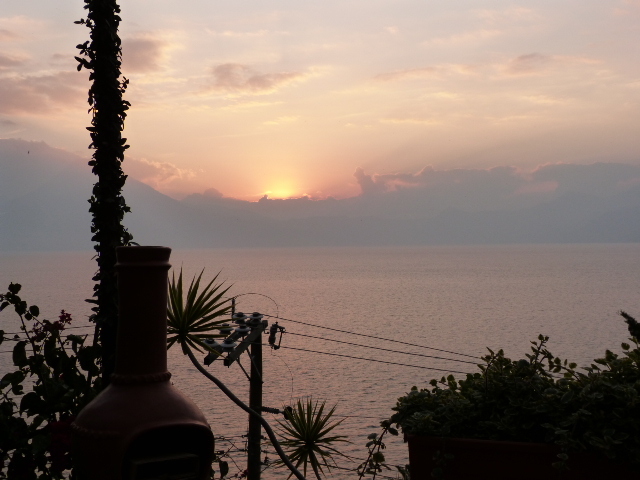 The rest of the day was unpacking the car, napping, visiting for a while with the neighbors Barry and Nanette, working on a few ukulele tunes, and relaxing with a sundowner margarita. Bill has a number of ideas for sightseeing and cultural experiences. The trip is looking to be an epic one! You could say that writing a novel isn't a safari, in the strict terms of physically moving from Point A to B with an enjoyable interlude upon arrival. I contend writing a book is a trip, especially if you get the nutty notion you're going to do it in less than a month. I have arrived as an author! My novel, Memories, Mummies, Mexico, was published exclusively for Amazon Kindle on January 23, 2015. Check out my Author Page on Amazon.com. I read a book in the summer of 2013 called The Happiness Project, by Gretchen Rubin. In it she described 12 monthly projects she did to increase her happiness. One of those projects was to write a novel during the National Novel Writing Month, November. Friends had told me I should write a book. The idea appealed to me but I had no clue what to write about. No worries! Rubin told me about a book called No Plot, No Problem, by Chris Baty. I ordered a used paperback from Amazon, read the book, and I was on my way! I had a trip to Guanajuato, México planned with my daughter for the last week in October and the first week of November. The trip would be our second to participate in Day of the Dead (Dia de Los Muertos) festivities. I took along my secretary (a Google Nexus 7 tablet) to take dictation and a small laptop to work with images. When November 1 came I started writing. The goal if you participate in the novel-writing month is to produce a 50,000 word draft manuscript in 30 days. To do that you have to write 1500 words a day. Not difficult if you have a "secretary" and you can dictate a stream-of-consciousness narrative to be edited later. I wrapped up my project a couple of days early and my draft was over 55,000 words! The idea for the plot and the characters popped to mind readily. Telling the story evolved naturally. I had done a bit of research on what makes a good novel and I tried to incorporate what I learned. I'm happy with the result. There are many resources available about publishing eBooks. I had to research the process and gather relevant info on that, also. Click here to view the trip photo album on Google+. Celebrating The Day of the Dead in a small historic colonial city tucked into a valley in the Mexican mountains. We spent a week in San Miguel and a couple of days in Guanajuato in the mountains of Mexico. The purpose of the trip was sightseeing and to participate in Day of the Dead (Dia de Los Muertos) activities on November 2, 2013. I realized during my two weeks in Platanar, Costa Rica in June that my Spanish skills needed improvement. I researched language schools and found one in Turrialba, Costa Rica. It's a small town east of the capitol San José. It's most noted for a baseball factory and its proximity to the Turrialba Volcano. I purchased a week's study that included a home stay with a Costa Rican family who provided two tasty meals a day. Lili and Alphonso were a sweet retired couple who were happy to serve as my tour guides in the afternoons. Classes were in the morning. Two weeks in a comfortable villa, located near Mt. Arenal (pictured) a nearly-active volcano. Our landlord acted as our concierge and helped us plan our activities. Costa Rica is famous for its natural beauty, it's eco-tourism and the positive attitude of the "Ticans", who frequently say, "Pura vida!" Loosely translated that means, "It's all good!"